There I was in Little Tokyo, at the Weller Center and in front of Orochon Ramen, arguably the busiest storefront in the entire plaza. So busy was it that the seats overflowed out into the outer walkway. No one there was older than 35. There was a good ratio of Asian faces to downtown hipsters (I saw a twenty-something mustachioed man with a skull cap and an ironic purse). Everyone slurped wash basin-sized bowls of soup with gusto, a few dabbing themselves with napkins since Orochon, if you don't already know, is known for the spiciest ramen on this hemisphere. 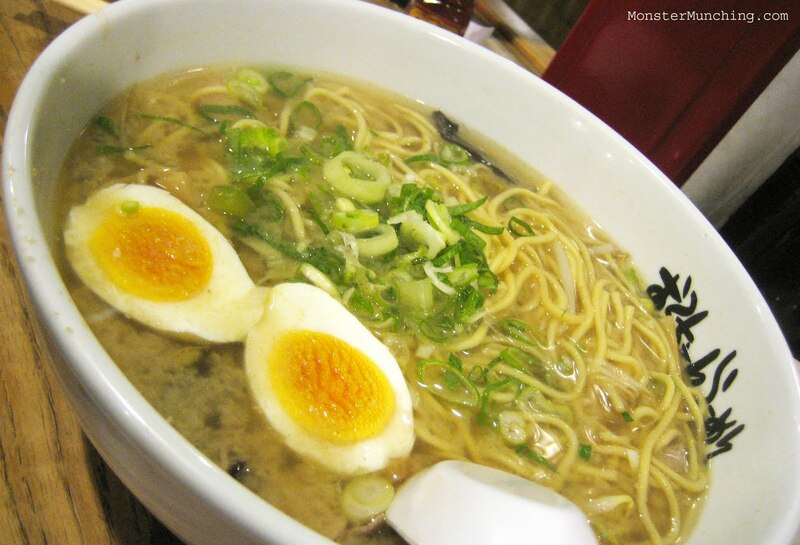 Rameniac calls it a "gimmick ramen", and I would have to agree. There is a so-called "Wall of Bravery" where Polaroids of past victors (presumably with led-lined stomachs) are holding up their licked-clean bowls of lava. A better photo would be what they looked like the morning after. A sound clip that records their bathroom agony would be worth a listen. 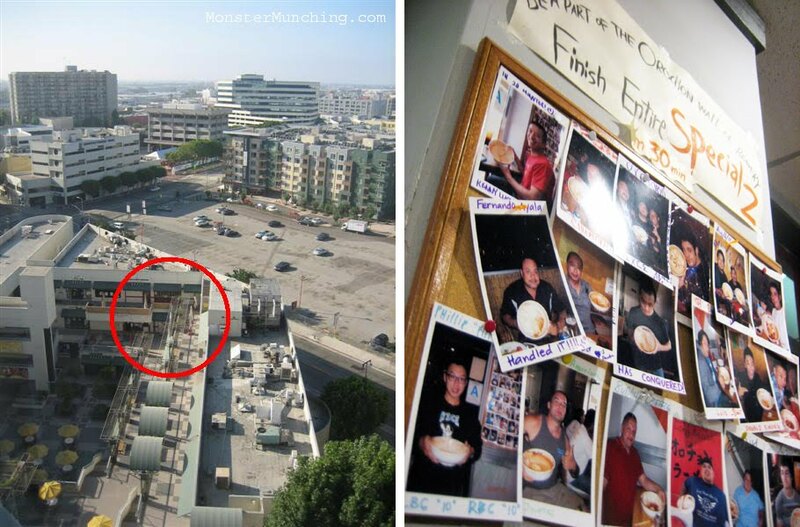 If he hasn't been here already, this is fodder for one Adam Richman (UPDATE: He has been here, CLICK HERE FOR VIDEO). Orochon actually sells milk as some sort of futile antidote for those who attempt to finish the bowl in 30 minutes. I am not such a man. Though I can handle my share of spice, on the mention of a hot spicy soup that attacks on both fronts (Fahrenheit and Scoville) I squeal in fear. My insides might as well be made of cheap tissue paper. I envision all sorts of medical calamities that my insurer would surely not cover citing a stupidity clause. Instead I chose the miso ramen at two notches above "no spice", and it was enough. It stung pleasantly, but I could still taste the slightly nutty, slightly milky rich broth. At this level of hotness, the soup is a thrilling suspense movie instead of an all-out gruesome slasher picture. The noodles were surprisingly unlike ramen and more like spaghetti. The usual extras like egg (nicely boiled to a still creamy orange yolk) are literally extras here: you have to order them separately. Meat consisted of thin shavings of pork, not the usual thick cuts of chashu (which is another nominal extra), but I enjoyed the bell peppers, the kikurage (wood ear fungus) and the bamboo shoots, which crunched fresh and clean. But the best of all were their gyoza, which looked more like they cross-bred it with a Chinese shumai. 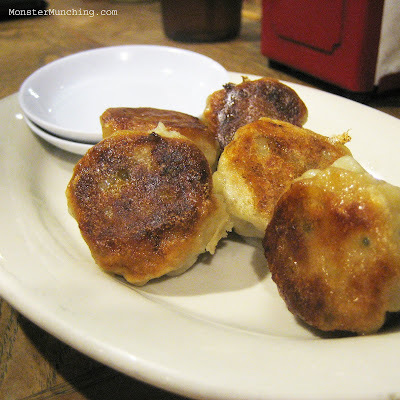 They had open tops like one, but browned crispy bottoms like a typical potsticker. A dip in a slurry of vinegar, shoyu and chili oil weren't required but did well to contrast the pork and onion sweetness that burst forth from each morsel. If the restaurant served this and only this, I'd still recommend the place. And if they ever held an eating contest centered around them, I'll put down my gauntlet and say I can eat about a hundred. Oh why why did I not stop by when I had the chance.Maybe next time. Gimmicky...it sure is because I've been wanting to come here ever since I saw it on Man v. Food. I am less excited now that you have described it in details. I'll take my time making my way here then. It'll still be here when you get back! Place is popular! I didn't go out of my way to eat here either. Just found myself here...and in that kind of situation, the place is great! Otherwise, it's still Santoka for the win! Haha... I was just thinking Adam Richman when I read the name of your post. And I thought of him too! I actually didn't know that he'd been there when I was eating. But I did think, "Hmm, this would be perfect for his show!" And it was! I saw that episode too. I've been wanting to try Orochon for ages but with all the new ramen restaurant openings it keeps getting pushed further and further down my list.